(Published in hardcover as The Campbell Plan) In 2005, T. Colin Campbell, PhD, and Thomas Campbell, MD, co-authored The China Study, in which they detailed the groundbreaking research results showing that a whole-food, plant-based diet has the potential to prevent and reverse many chronic diseases. The China Study became a worldwide phenomenon, selling more than a million copies and inspiring countless readers to reinvigorate their health by making better food choices. 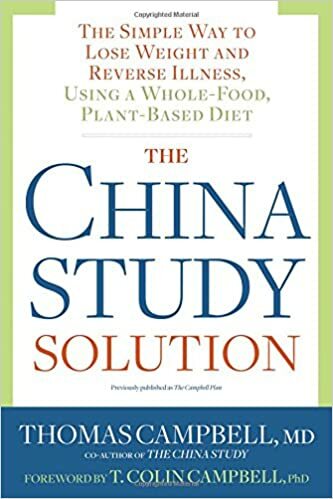 In The China Study Solution (previously published in hardcover as The Campbell Plan), Dr. Thomas Campbell goes beyond the why and shows you how to make the transition―and enjoy the journey―with practical guidance and a simple plan to make a whole-food, plant-based lifestyle easy and sustainable. The China Study Solution tackles the most contentious questions: Is soy healthy? Should you eat gluten? Do you need to eat organic? Should you eat fish? Is GMO dangerous? How should you feed your kids? With more than 55 easy recipes and a 2-week menu plan, The China Study Solution breaks down cutting-edge nutritional research into easy-to-follow instructions on what behavioral principles are needed to succeed in your journey, what to stock in the kitchen, how to read labels and shop, and how to navigate social and eating-out situations. Whether you wish to lose weight, reverse disease, or enjoy the best health of your life, The China Study Solution provides step-by-step guidance to help you achieve your goals.